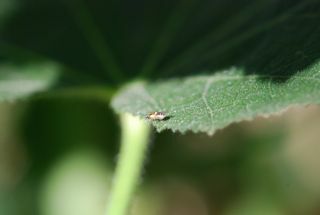 In a previous post about hollyhock visitors, I mentioned the plants had spider mites. I wondered when the spider mite predators would show up. Turns out I didn’t have long to wait. Those grayish black circles towards the top are lady beetles, but not the large orange and black ones like you might expect. These are called spider mite destroyers (Stethorus picipes). If you were not looking closely they might look like a bit of dirt or tiny seeds on the plant leaf. I can tell they are lady beetles by their rounded shape. 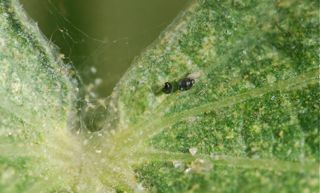 The lady beetle larvae are on the plant feeding on the spider mites as well, as evidenced by the greyish pupa lying along the middle of the leaf. 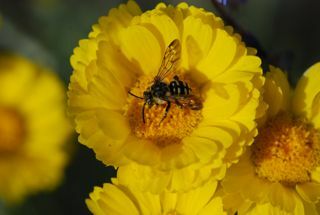 You can see more of the life stages at the UC Davis IPM Online site. 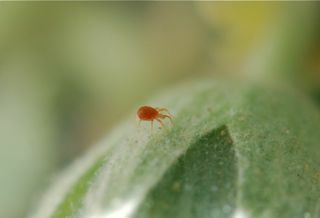 A large red mite like this one might seem to be a bigger version of a problem mite, but it is actually a beneficial predator of spider mites. 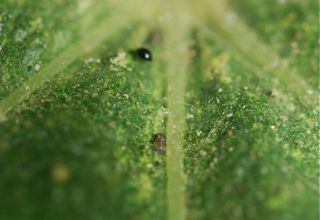 When you see single red mites that are readily visible and actively crawling about on leaves, that is probably a predatory mite feeding on plant mites or small insects. Mites have round bodies and eight legs. 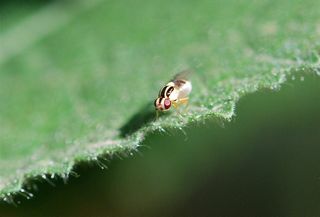 Other point-sized predatory insects on the hollyhocks are minute pirate bugs (Orius tristicolor). (That is “minute” as in small, not the word for time.) The adults are black and white. Minute pirate bugs feed on a number of small insects and mites. 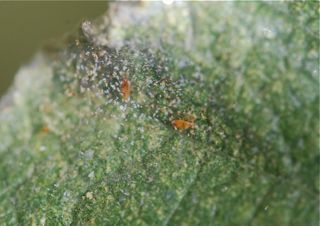 Here are some young pirate bugs or “nymphs” feeding within the webs of the spider mites. The nymphs are orange. 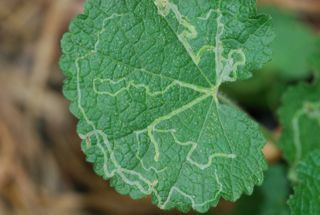 For a better look at the life stages, try this biological control page. 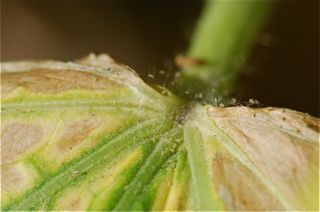 I didn’t get photos, but there were also some predatory thrips eating spider mites. 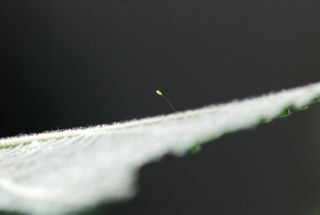 Thrips are often thought of as plant pests, but some species are predatory. It is great to see all the beneficial organisms having a banquet of spider mites. And I didn't have to do anything except watch the show. 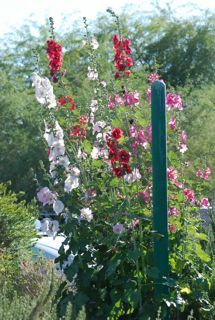 This week the hollyhocks will catch your eye here in Arizona. 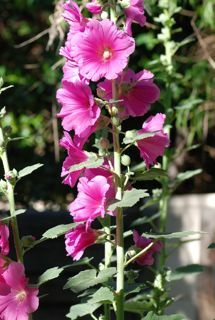 Tall, with large, striking red, pink, or white flowers, the hollyhocks are a favorite. Certain insects and arachnids also seem to prefer hollyhocks. 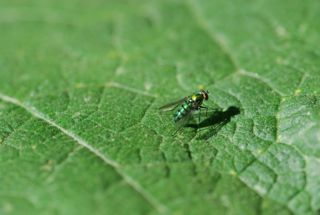 Shiny metallic-green flies were resting on the leaves this morning. Any ideas what they were doing? 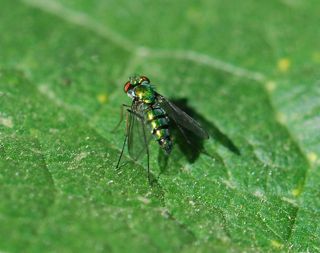 Called long-legged flies, the small green flies are predators waiting to catch other insects for food. Tiny, pale green leafhoppers like this one are a meal for long-legged flies. Another fly I found isn’t quite so welcome. This tiny yellow and black fly is an adult leafminer. 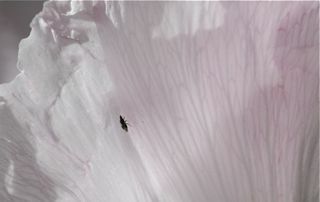 The fly will lay its eggs in the hollyhock leaves. 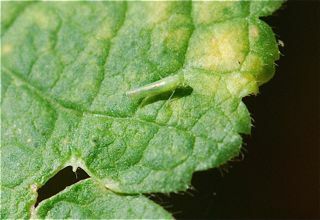 The larvae will feed between the upper and lower surface of the leaf causing a winding light-colored tunnel. Fortunately the damage is relatively cosmetic (looks only). Other creatures already hard at work on the bottom leaves of some of the plants are spider mites. The spider mites make fine webs like spider webs, hence the name. 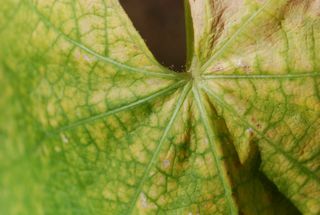 In our hollyhocks, the mites quickly build up, causing the leaves to turn yellow and die. Hopefully, some predators will show up that eat spider mites. Here’s a sign that at least one predatory insect is about to make an appearance. Do you know what the stalk is? I'll give you a hint: it is on the underside of the leaf (I flipped it over). Author RobertaPublished on March 4, 2009 March 4, 2009 4 Comments on Bug of the Week: Is it a bee, wasp or fly? This bug of the week raises more questions than it answers. It is yellow and black. Is it a flower fly? 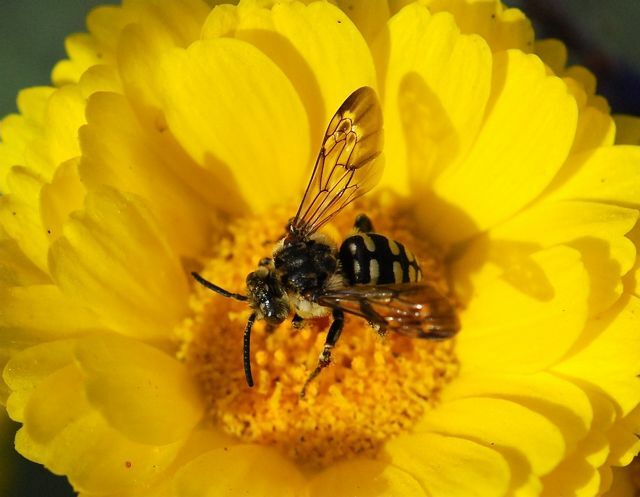 A close-up shows it has four wings and a fuzzy body, which makes it a bee. Now, what kind of bee is it? 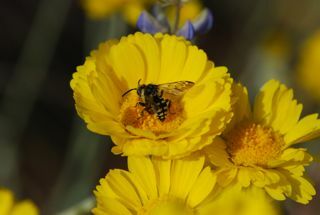 Published on March 4, 2009 March 4, 2009 Categories Bug of the Week, Learning OutdoorsTags bees, beneficial insect, solitary bees4 Comments on Bug of the Week: Is it a bee, wasp or fly?